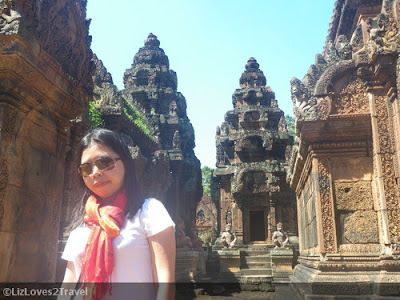 We decided to take a 2-day temple tour in Siem Reap in lieu of our canceled trip to Ayutthaya in Thailand. Ayutthaya was closed to tourists that time because they were heavily flooded and damaged, so we replaced it with another day of temple tour in Cambodia. On our second day, we didn't have to wake up early for the sunset. Our phasing for that day was more chilled and relaxed. 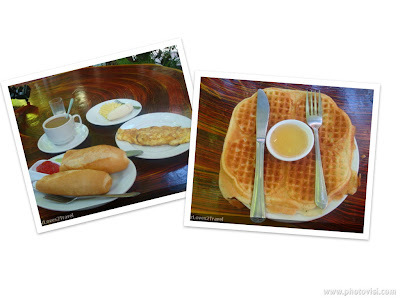 Of course, we started the day with an awesome complimentary breakfast from our guesthouse Bou Savy. I had my omelette with bread and jam while Beau got a huge banana pancake. Yum! Off we went to another temple journey. 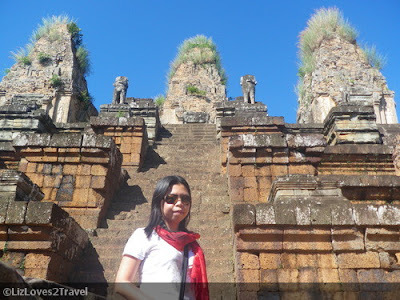 Our first destination that day was East Baray. 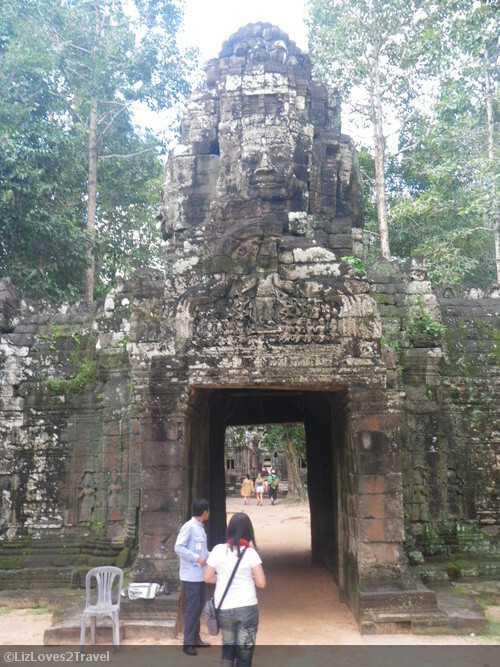 We visited the temple-mountain Pre-Rup. 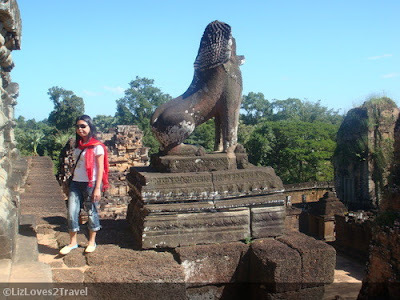 It used to be the state capital before Angkor. The temple's name has a strange meaning which is "turning the body", pertaining to a corpse's cremation rite in its cistern foreground. This temple features imposing brick towers and the views from the upper terrace is just stunning. The temple exudes a beautiful reddish tone during sunrise and sunset. The harmony of colors between sandstone, brick and laterite makes it look magnificent. The next temple we visited became one of my favorites, the Banteay Srei. The literal translation of its modern name is "Citadel of Women" or "Citadel of Beauty". This might be related to the many devatas you can find in its wall carvings. 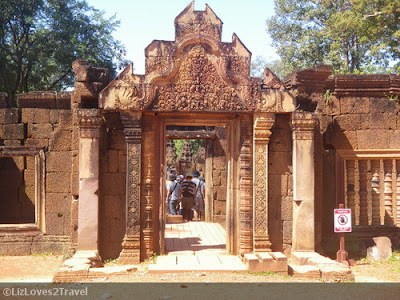 It is majorly built with red sandstone which made it look more alluring. 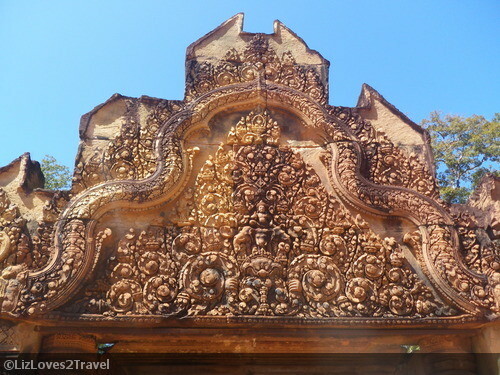 In my opinion, it has the most elaborate wall carvings among the temples I saw. What a beauty! The building dimension is tiny compared to the normal temples. Everything around here seemed to miniscule. 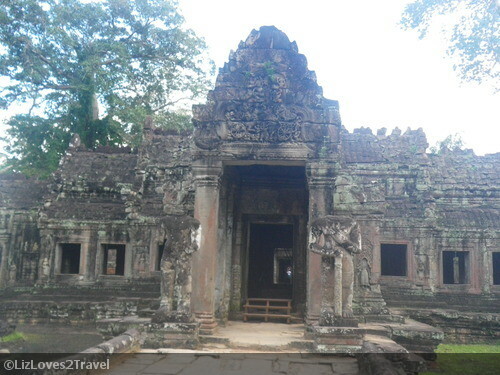 It is also different among the other Angkor temples because it was not built by a monarch. 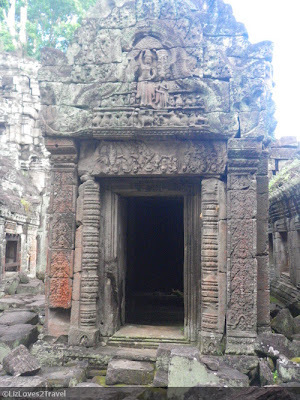 I wish I had a longer time to marvel on its beauty and to appreciate the bas-reliefs more but we had to go. Time for lunch! Lunch was over and time to move on. 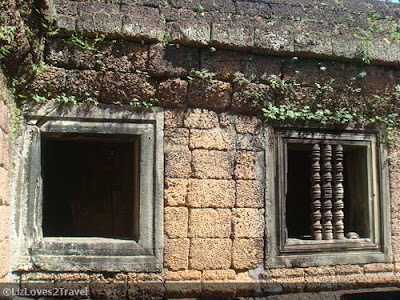 We went to Banteay Samre next, still in East Baray. 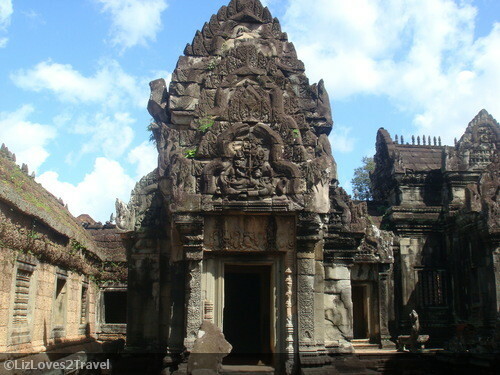 The temple is named after the ancient Indochina people, the Samres. This is the most distant among them. It is relatively isolated therefore has fewer visitors compared to the other temples. Because of this isolation, it is the most restored one as well. For me, the structure of this temple is very much similar to Angkor Wat. But others say it looks more like the temples of Phimai in Northeast Thailand. I don't know because I haven't been there yet. But when I Googled it, I said to myself "yeah right!". does it look like a mini Angkor Wat? 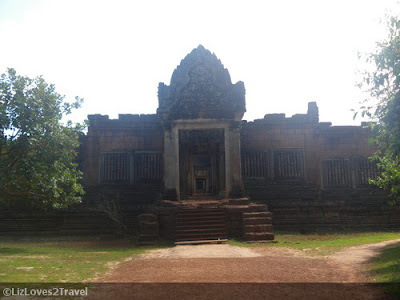 We traveled back to Northeast Angkor and visited a small temple called Ta Som. It was built on the Bayon period during the reign of Jayavarman VII, along with Ta Prohm and Angkor Thom. Unlike the other temples, this is largely unrestored. Trees and other vegetation are growing among the ruins. 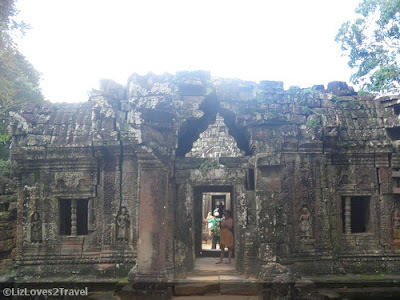 We then proceeded to northeast of Angkor Thom and visited Preah Khan. They say it was more than just a temple for it had also been a Buddhist university. Its modern name means, "Holy Sword". History connotes that this was built on the site of a major battle where Angkor was reclaimed from the Chams, and that the Cham king died here. So this temple was built in commemoration of their victory. FYI, according to what I've read, Chams are Vietnamese. 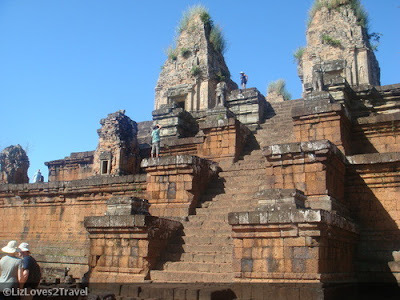 The temple structure is merely flat and rectangular. It is not as flamboyant as the other temples. 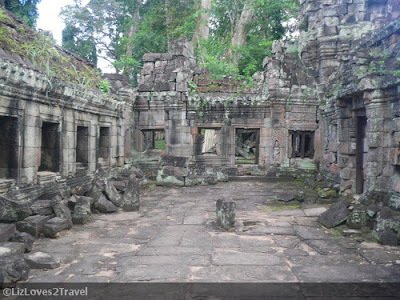 Similar to Ta Prohm and Ta Som, this temple is majorly unrestored. Ravenous vegetation ultimately damaged the temple. I believe the restoration efforts has stopped which is very obvious on the scenario below. 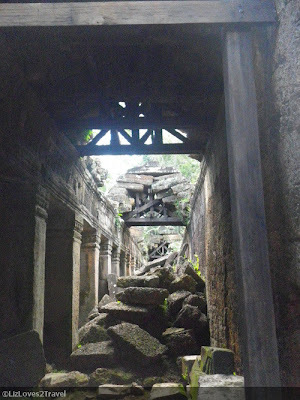 We skipped seeing the sunset at Phnom Bakheng. It was cloudy anyway. 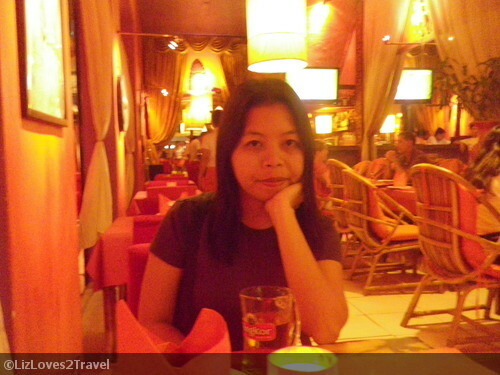 We just rested early because we had plans of hanging out at Pub Street that night. That same day, we took advantage of our free dinner at the guesthouse which is part of the package promo that we availed. 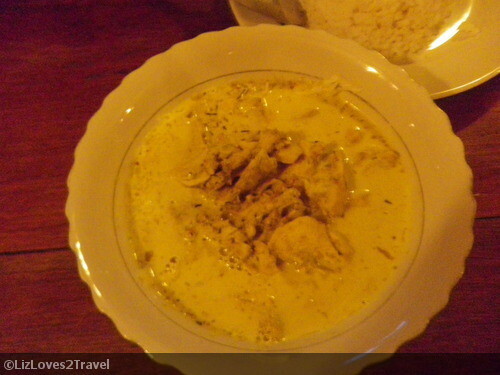 We decided to try local Cambodian dishes. 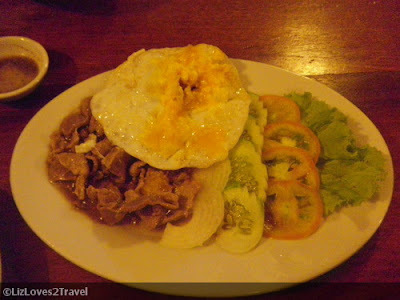 Beau ordered Beef Loklak because I was raving about it the other day. I tasted it to compare if it came close to the one I ate. Unfortunately, it did not. 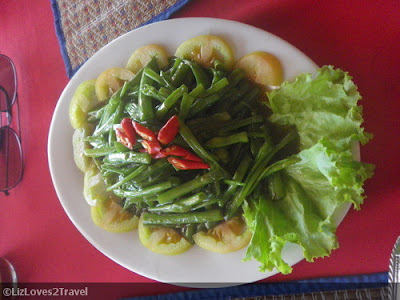 How I wish I remember or took note of that restaurant's name so I can come back for it or recommend it in Trip Advisor. We headed to Pub Street for some nightlife and beer drinking after supper. Beers are cheap! One funny sign that we saw in one of the bars says "Happy Hour All Day". Then they should have written, Happy Day. How can an hour be all day (a day has 24 hours)? Confusing eh? Haha. We ended our day in a spa. We had an hour and a half foot spa at a bargain price. Hehe. We haggled to lower the rate and they took it. We really enjoyed it. I wish I took photos but heck, I was too relaxed to do so. Their massage technique was different and it really soothed our tired legs and feet. It was amazing. I felt a little sad we had to leave the next day already. I've learned to love Siem Reap in 3 days. That's the sad thing about traveling. You have to be constantly on the move. You can't settle with just one destination. 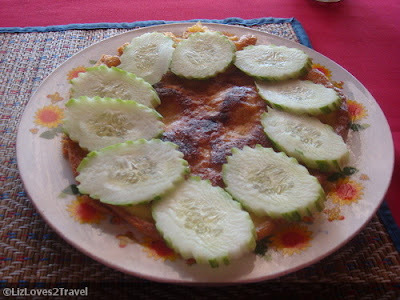 This is Part 4 of my Cambodia travel series. Thanks a lot for a gathering of good tips. I look forward to reading more on the topic in the future. Keep up the good work! This blog is going to be great supply.